Last month I had the pleasure of teaching Planned Improv: Scrappy Squares to each of my guilds. I had a great time and the quilters enjoyed learning my technique for some improv design... with a few rules. I led a 6-hour workshop for BAMQG, followed by a presentation and demo for Quilting 101 with SCVQA. The first portion of the workshop includes some design work. Here's a look at some designs in progress. 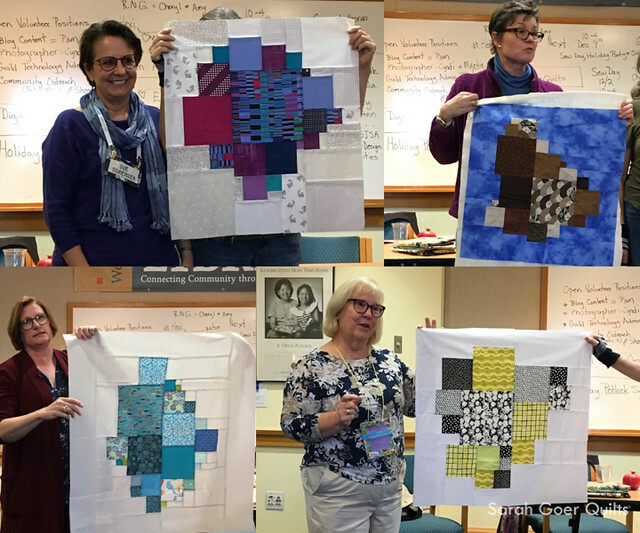 Many of the BAMQG quilters, including Jaye, Diana, Joelle, and Michelle-Nicholle, finished their slab in class. Since both of these classes were with guilds I belong to I got to see some progress and finishes at the November guild meetings. Sue, Marty, Mary C, and Mary M brought in their finished quilt tops for show and tell at BAMQG. 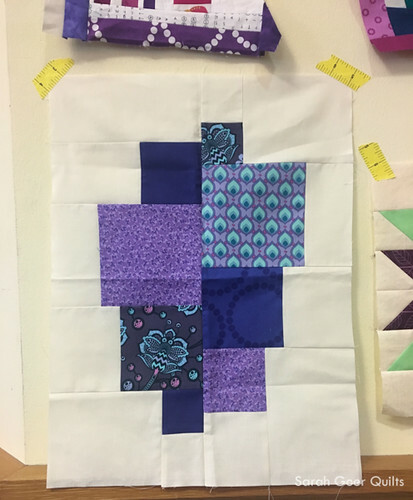 Mary C even made another Scrappy Squares slab as her contribution to November's colorist for Color My Quilt. Bobi, Sandie, Patricia, and Sally showed their quilts off at the SCVQA meeting. Sally added ties and made her quilt into a sewing machine cover! Thank you to BAMQG and SCVQA for having me. I had so much fun! 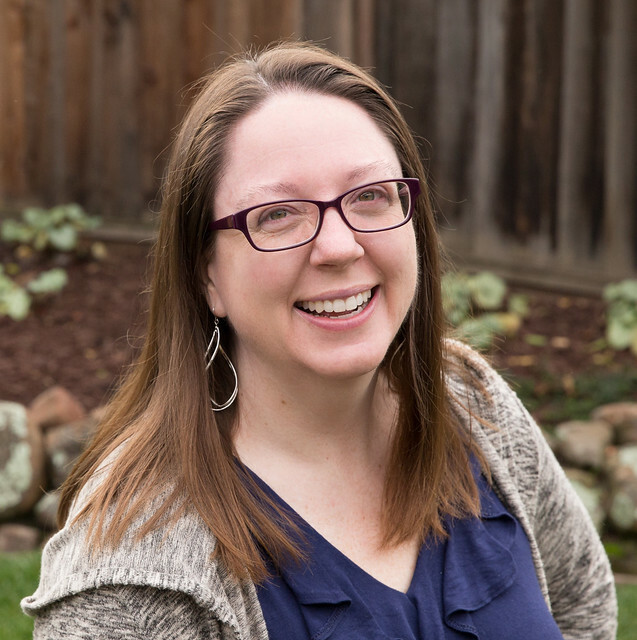 I was a classroom teacher for 11 years. I taught middle school math. This is the 8th year I've been out of the classroom and it felt so great to be teaching in front of a group again! My second workshop offering is in the works and I look forward to teaching to more guilds in 2018. Posted in Quilting. 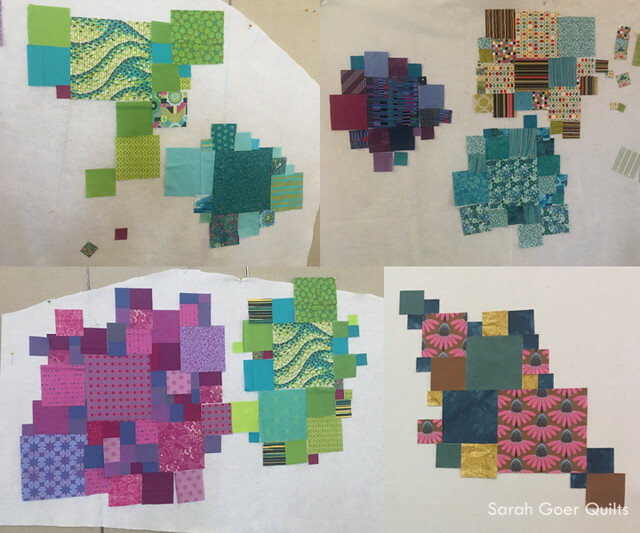 Tags: planned improv, scrappy squares, SGQ workshop on December 6, 2017 by sarah. That’s so great Sarah! Teaching is in your blood. I learned so much in your class. I can't wait for the next class! Thank you, Nancy! I had a great time and look forward the next class, too.